Tonight! Catch @DJMIMDC djing at the “Return Of The Queen w/ @Luenell” show! 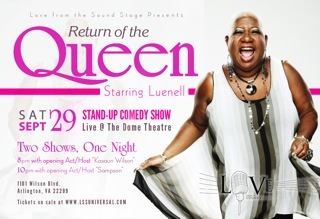 Our own DJ MIM hits the stages to MC and DJ tonight at the Dome Theatre (1101 Wilson Blvd, Arlington, VA) for the “Return of the Queen” starring Luenell! There’s two shows: 8p and 10p! This entry was posted in DJ MIM and tagged Arlington VA, Comedy Show, dj mim, DJMIMDC, Dome Theatre, Love From The Sound Stage, Luenell, Return Of The Queen by MIM Entertainment. Bookmark the permalink.